If you are looking for Photo Art Friday - the January 6th - 8th edition click HERE. Welcome to another tutorial on how to make a piece of abstract art using your own photographs and some abstract, vivid textures. The process demonstrated involves only the most basic Photoshop tools and edits. Anyone can do it. Trust me! Once you follow this work flow, you can add in all kinds of other edits, depending on your experience and skill set. Know, however, that there are many ways to reach the same goals in Photoshop, I can only demonstrate the way I do things. They may not be the most efficient steps, but they get it done! This tutorial was not pre-planned. I took the screen shots having no idea what the final results would be. So like any session of artistic exploration, you get what you get and if you save things you like as you go, you are creating a bank of material that you can go back to and tweak later. What you want to grasp here is the process. Once you master the simple concepts of how to proceed you can then do the same with any and varied component parts. Then, once you are comfortable with the basic process you can add your own edits into the mix. Ideas for other and better ways to proceed will surely occur to you. Above all, have fun! 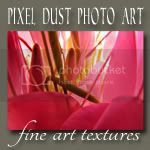 To begin I chose photographs from my archive that have interesting graphic elements on which I could apply a vivid texture. I used one photograph (pond algae) as the background and placed three other photographs (fence, burgundy leaves, purple flowers), as 'the muse' moved me, on that pond scum background, leaving some of the algae visible. If you look at the layers panel on the right of the screen shot you can see that as you place each photograph it is added on a separate layer. You could use your bounding boxes on one or all photos change up the size of your photographs and/or to rotate them a bit so they are not all squared as in the example above. Now I want to reduce the realistic details in these photographs and distort/simplify their appearance a bit. To do so a PS Filter will be applied. 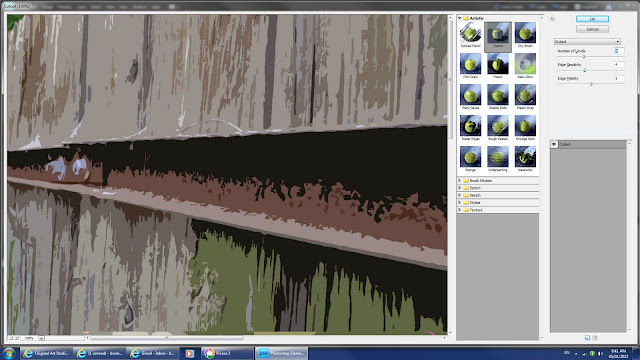 Before I can activate the Filter Tool, I have to flatten the layers and then duplicate the just made flattened layer. 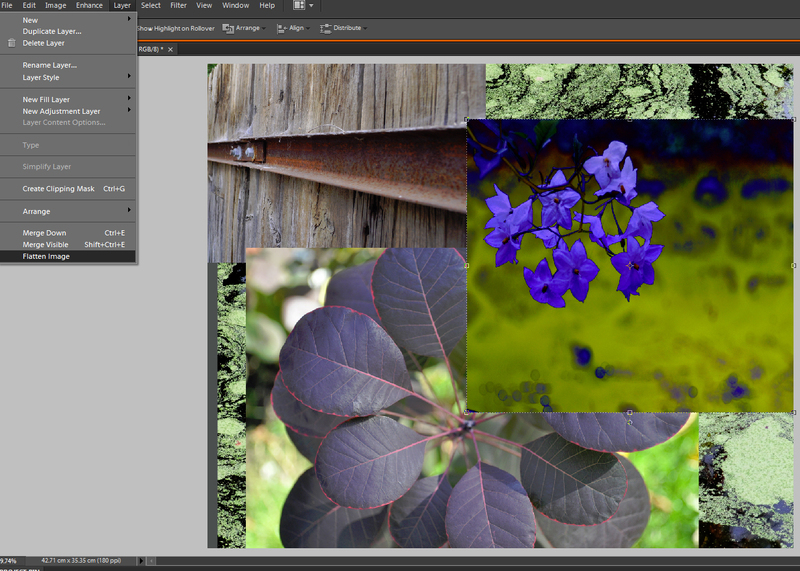 Layers>Duplicate Layer (this is simply in preparation for applying the Filter). When you select Cutout a drop box appears that allows you to make choices with sliders about the degrees of distortion you desire. For this piece you can see in the upper righthand corner that I chose: Number of Levels - 4; Edge Simplicity - 4; and Edge Fidelity - 2. Above you see the result of applying the Cutout Filter on my composition of photos. 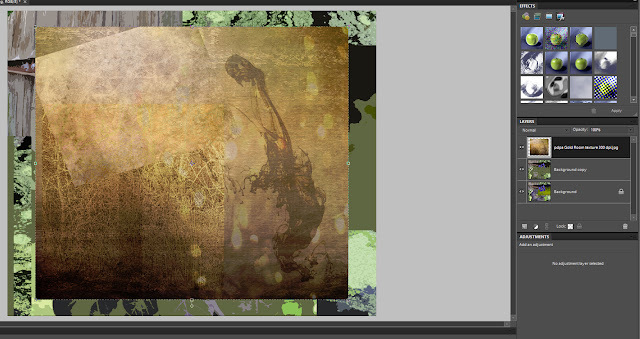 The images are already looking a little less realistic and more abstract. Satisfied with that, it is time to select a texture to apply to the photo composite. I select and apply my abstract art texture "Gold Room". 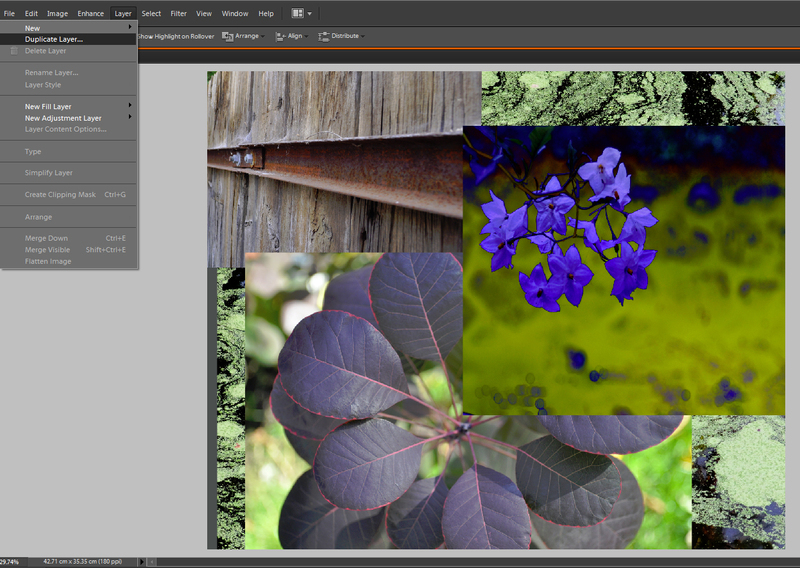 With the Move Tool and its bounding boxes (not visible in this shot) I pull the texture to fit over the photo grouping. 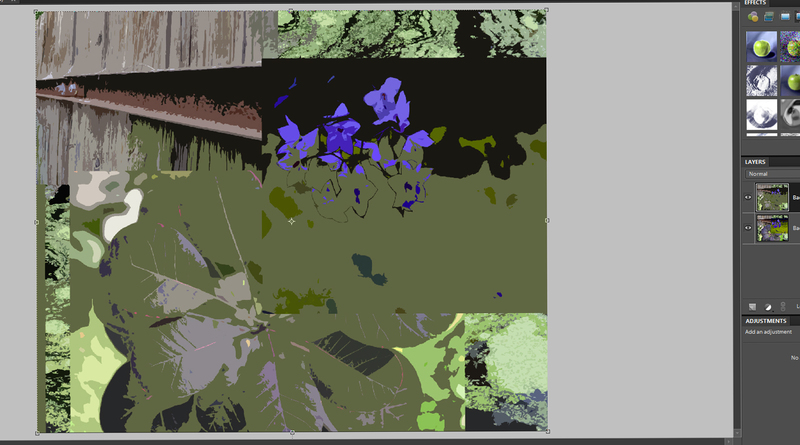 The first blend mode applied is Difference, adjusting the Opacity down to 76%. 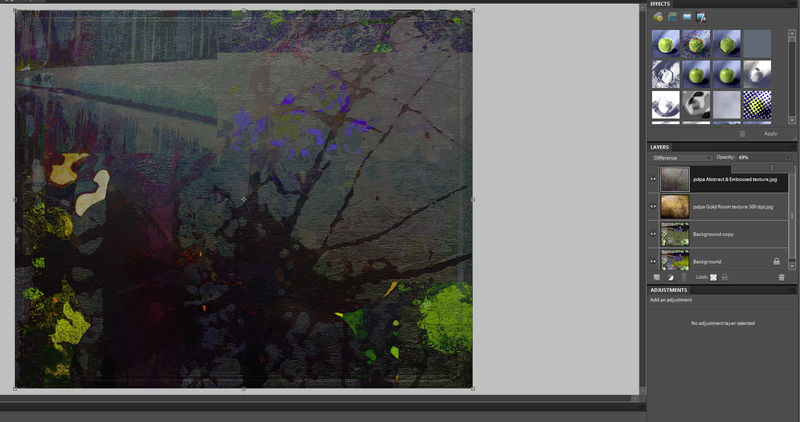 But I want to see how other blend modes will marry all the elements. Let's try Multiply. It's dark so I reduce the Opacity down to 70%. Hmmm rather moody - I like it. Love the sudden appearance of black in the upper right quadrant. Notice how a bit of black in some compositions gives a rich, grounded feel to the piece. 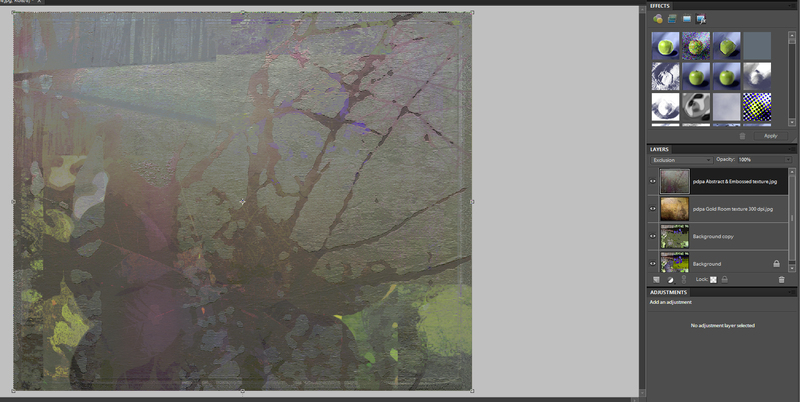 Let's see what a little more light will do by blending in Overlay at 81% Opacity. Nice, but I prefer the darker moody look. I'm feeling that the whole thing is not quite abstract enough ... yet. 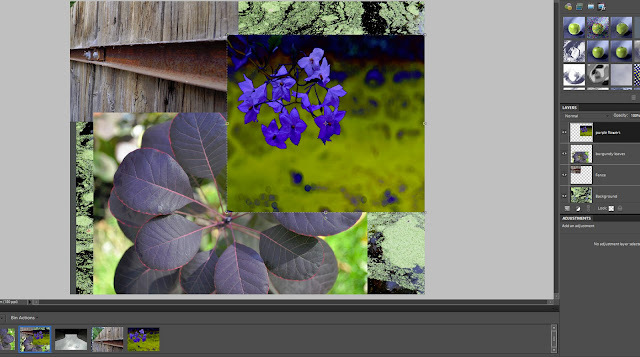 Color blend mode usually produces a more monochromatic look. Let's try it at 100% Opacity. You may notice that you like results that are not my favs. That is how it should be! As artists we have our own aesthetic and therefore different preferences. Trust yourself and your preferences, its YOUR art. Here's Exclusion at 100%. Perhaps more abstract but not my preference. Here it is in Screen at 70% Opacity. 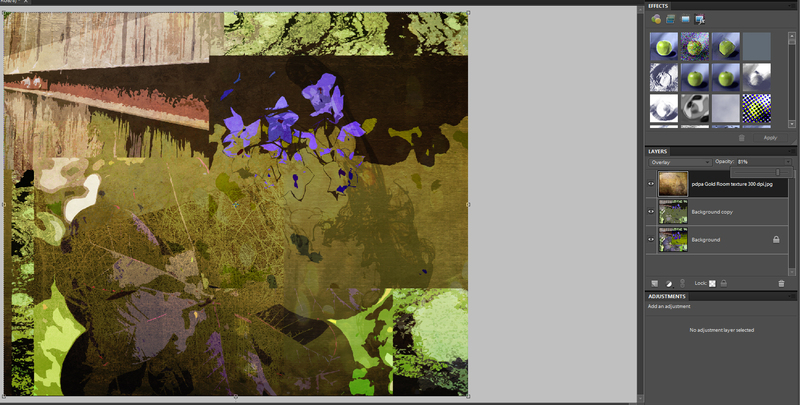 I'm feeling like adding another texture to see if I get something I feel more excited about. One more blend mode first, - Color Burn at 65% Opacity. Think I will apply another texture to this Color Burn blend result. The photo/texture composite is quite dark, so because there is a lot of pale and uncluttered background in it, I choose pdpa abstract art texture "Abstract & Embossed", activating the Move Tool to place it. 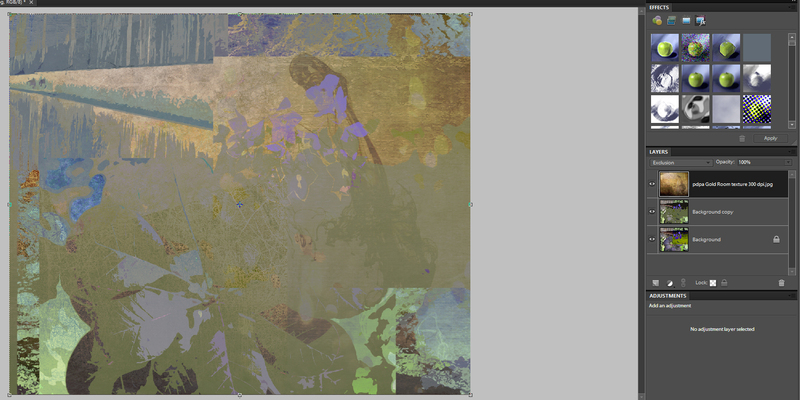 First blend is in Screen at 100% Opacity. 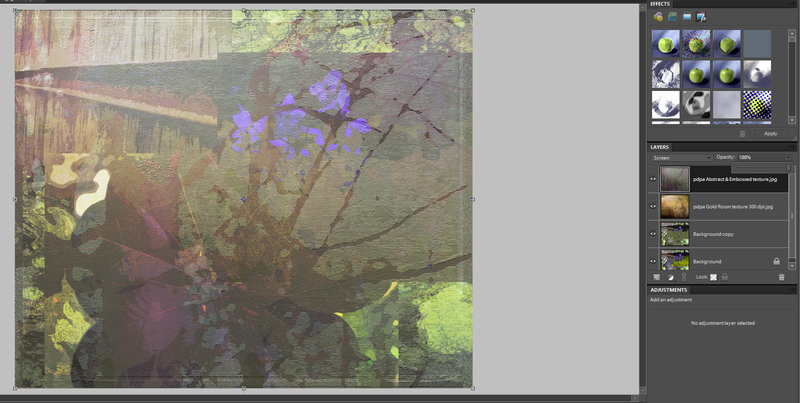 I'm liking the more abstract qualities achieved with the addition of a second texture. 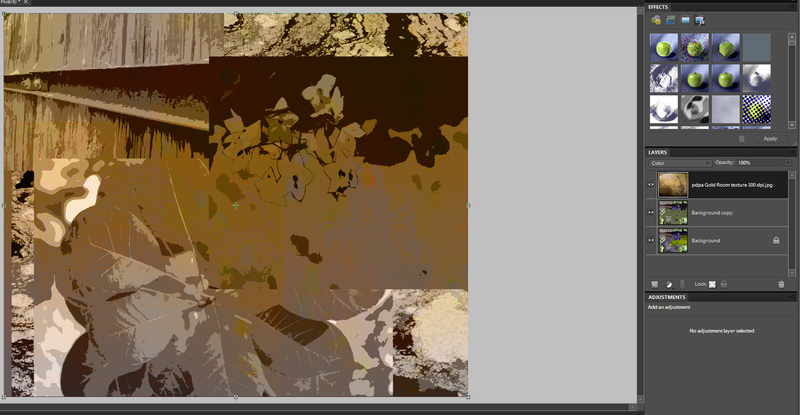 Exclusion at 100% opacity is rather muted. It's rare that I get anything I like in Exclusion - but you never know. I have been surprised, so usually give it a try. As you see it's a 'feel your way along' sort of process. You have to be prepared to keep experimenting until you feel a visceral "WOW" emerge in response to what you see on the screen. Here we end our search with Lighter Color, 75% opacity. Think I will conclude with this one. I am not wowed by this result but I am satisfied. It will benefit from a Levels Adjustment later. 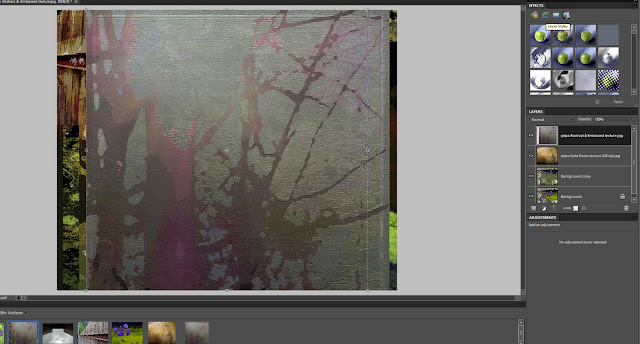 I can also see where I would like to use a layer mask on one of the earliest layers to remove/soften the edges of the photos. 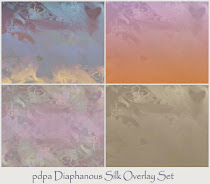 I saved (File>Save As) some of the previous blend examples that I liked. They were saved as PSDs to preserve the layers. I can always go back and make little adjustments to ones I like - and so can you! You can make a Levels Adjustment to bring in more light. 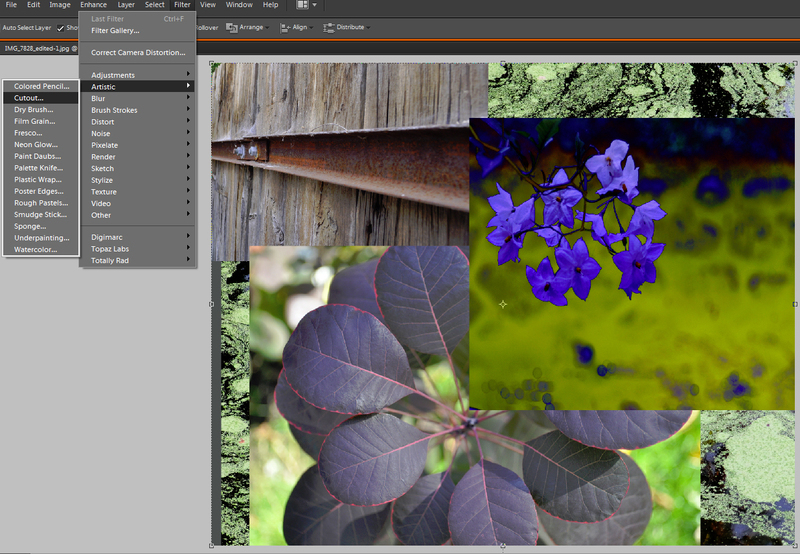 You can adjust Saturation, or you can can add a Photo Filter in the Adjustments Panel to warm up or cool down your image, Layer Mask to remove things, etc. etc. etc. We'll explore those options in a future tutorial. * Don't get discouraged if your first attempts are not all you hoped they would be. I often abandon pieces that just don't have the photo art qualities I am looking for. It is a trial and error experience and we learn much from our 'errors'. It's only by repeated experiments that we become adept. 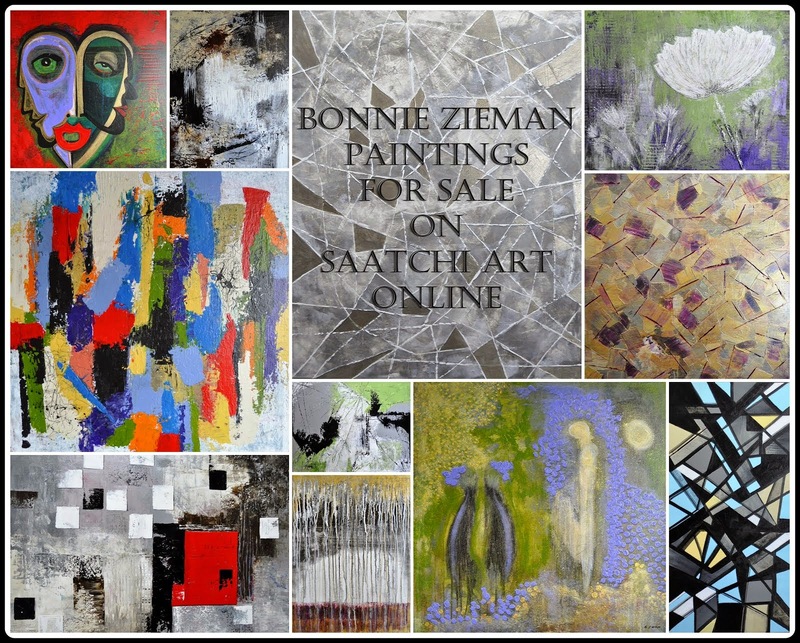 Hope you will send me a link to some of your abstract photo art creations! With your permission, I may create a future post to share some of them. Incredible - thank you so much for the tutorial! I can't wait to attempt this with some of my own images. This is so cool. 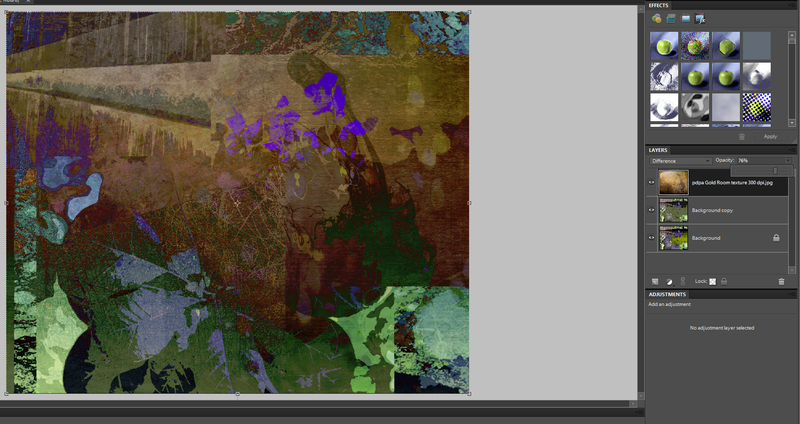 I've been experimenting just a little with putting a piece of reality in some abstract. I think I'll try your tips here and 'push the envelope' just a bit more. It is so much fun. So far I've been using the freebies you've given us. It's just about time to buy a few and see what I can do with them. Think this is very nice, and have never tried combining several photos in the same shot. Now i have tried it, but definitely need some , ummmmm, practice on this. very nice, and gives me good ideas! Thanks Bonnie! Bonnie, thanks for sharing your process and your ideas in this tut. 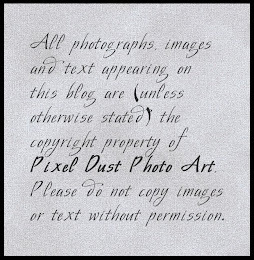 I found it very interesting how you added 3 photos to another and then applied filters, followed by textures. You are broadening my mind every time I arrive here! This was intresting, thank you. A delicious and interesting process.